This accolade, which ranks Tassili amongst the very best restaurants in the UK, is awarded to very few establishments. The team at Tassili, the fine dining restaurant at the 5-star Grand Jersey Hotel, is celebrating having been awarded four Rosettes by the AA this week at a gala event at Grosvenor House in London. It’s a fantastic achievement for Nicolas Valmagna, Executive Chef and Luis Silvestre, Sous Chef at the AA Five Star St Helier hotel – part of the Hand Picked Hotels group - who have been working tirelessly to put Tassili firmly on the map as one of the island’s best gastronomic experiences. Four Rosettes are awarded to restaurants which according to the AA ‘exhibit intense ambition, a passion for excellence, superb technical skills and remarkable consistency’ and where ‘the cooking demands national recognition’. Nicolas’ style is largely French with overtones of British cuisine. Simplicity, taste, produce and technique are all key to his philosophy as he strives to showcase the exceptional quality of produce available on the island with signature dishes like crab, passion fruit gel, combava lime, bisque dressing and coconut foam that combine elements from both the land and sea around the beautiful island of Jersey. This year marks the 110th year of AA Hotel & Hospitality Services. The annual black-tie AA Hospitality Awards event is one of the highlights in the industry calendar and is attended by world-renowned chefs, prominent hoteliers, restaurateurs, hospitality gurus and key media. The event recognises and rewards the excellence of hotels, restaurants and their respective teams across the UK. 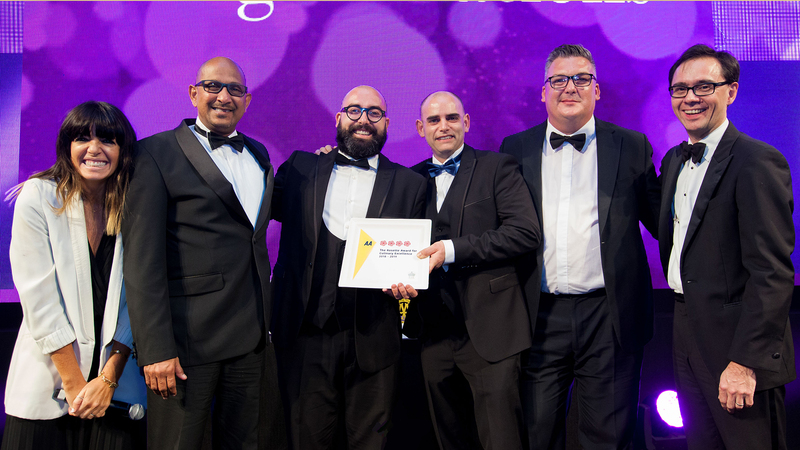 Host Claudia Winkleman, Hotel Manager Thusitha Sumanasekera, Tassili’s Sous Chef Luis Silvestre and Executive Chef Nicolas Valmagna, Award Sponsor Nick Salman from RAK, and Simon Numphud from the AA. Grand Jersey is the island’s stylish, sophisticated hotel and spa, presenting guests an exceptional experience. It offers the ultimate in comfort and glamour, through a blend of refined restaurants, the exclusive, atmospheric Champagne Lounge and the award winning Spa. Grand Jersey also features the innovative Park Suites – a dedicated business centre with private cinema, meeting rooms and flexible events spaces. Combining an opulent setting with an intimate atmosphere Grand Jersey’s 4 AA Rosette fine dining restaurant Tassili offers an exquisite modern British menu, with a decadent Jersey twist. This four AA Rosette restaurant represents the ultimate in sophistication with menus showcasing the very best of Jersey’s seasonal produce. Inspired by his French heritage, love of fresh produce Executive Chef, Nicolas Valmagna’s menus provide a breath of fresh air to the Jersey food scene. They feature a selection of local ingredients including chancre crab, scallops, Jersey Royals and black butter along with some of his own French favourites from the Pyrenees and Nantes region. Created by former lawyer turned hotelier Julia Hands, Hand Picked Hotels is the leading collection of architecturally stunning hotels offering guests an indulgent yet attainable country house experience, with a contemporary twist. The award-winning collection is renowned for its stylish guest rooms, elegant function spaces, fine food and wine and a personalised service by Hand Picked people in stylish, relaxing surroundings. There are a total of 17 classically British hotels in beautiful settings across England and Scotland and 3 Channel Island retreats, with locations ranging from the New Forest and Jersey to Yorkshire and Edinburgh. Hand Picked Hotels has won an impressive number of awards, with 15 hotels awarded two AA rosette status and Grand Jersey holding four rosettes. Eleven hotels have achieved red star status which means they stand out as the very best in the British Isles. There are also ten hotels with spas offering the latest therapies and treatments to promote wellbeing and relaxation.